Almost 4 months later and I'm BACK! 1. I'm busy with work-study-family. When I'm not attending evening classes, I'm looking after my little tot who is growing more and more precocious by the day. 2. I'm hit by writer's block - my writing skill has been reduced to 'BORING' that in the midst of writing a sentence, I yawned and then immediately clicked 'Save draft', and never opened it again. 3. My Samsung netbook monitor went kaput when it tumbled along the very rough terrain of a remote area in Sarawak while I was on a working trip there. The only way I could use the netbook is to hook it up to the big monitor in the study room. So it's not mobile anymore which then cramped my writing mood even more. 4. I got pregnant again. Eh? You must be wondering. Why I always use same excuse 'I'm pregnant'? First of all. That part about being pregnant is 100% true, Alhamdulillah. It happened almost 4 months ago, which coincides with the last entry I posted on this blog. In between March and July, I was so crazy sick with nausea and non-stop vomiting that I could not even get up, let alone think of what to write on my blog. It was a miracle that I managed to finish my semester and scored an A- in one of my paper. Ahem. Enough excuses. Let's now move forward. We are currently enjoying our semester break - hubby has dropped his intention to take the short semester because the subject he wanted to take turned out to be boring and full of assignments. So suddenly we found ourselves with a lot of time to occupy during the weekends (yes!). This weekend kicked off with swimming activity in the morning. You see, my boss' daughter-in-law recently gave birth and her labour was really fast and easy. My boss told us that she was an avid swimmer during her pregnancy. That made me thought, why don't I start now as well so that I could also have an easy birth experience? The thing I like about swimming is how it made my body feels light and more energetic. Also, when I float on my back, listening to my own breathing and the far away sound of my heartbeats, I feel totally relaxed. I imagine that is how my little baby hear and feel in my womb. In the evening, we went out for jalan-jalan. I wanted to watch movie - Madagascar 3. Sadly, there were only front seats left when we tried online booking so we abandoned the idea. 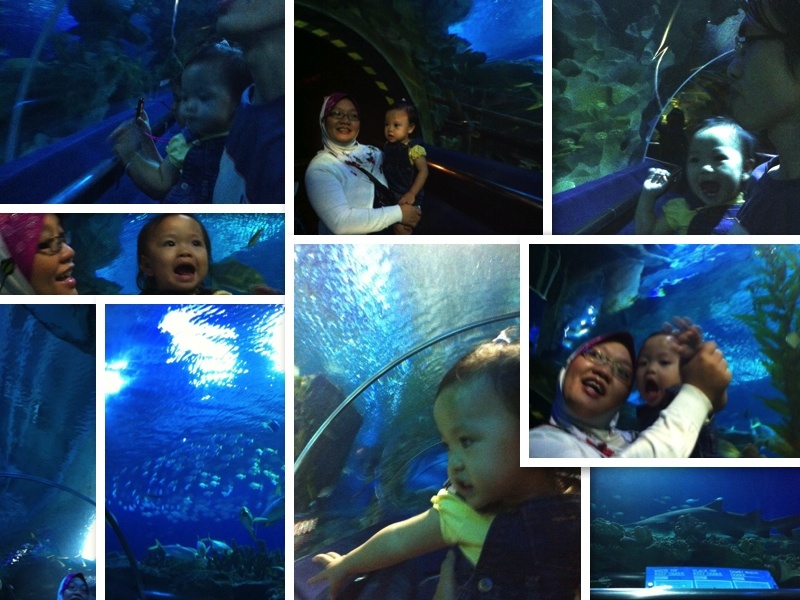 Hubby suggested that we bring Khayla to the Aquaria because she loves to watch fishes swimming in aquarium. What can I say more, we had a lovely time of course. Khayla ran about laughing and pointing at those huge catfishes and waving bye-bye to the swimming sharks, turtles, stingrays and various ocean creatures swimming above us. It was an endearing sight to see her having so much fun. Later we had dinner in KLCC and then had a bit of a shopping *wink* Can't tell what it is, but it made me very very happy that I finally can lay my hands on one! All in all, this was the best weekend we had in weeks, where we don't have to worry about assignment discussions, beating the deadline, attending replacement classes or doing exam revisions. Hope you guys also have a great weekend. Toodles!